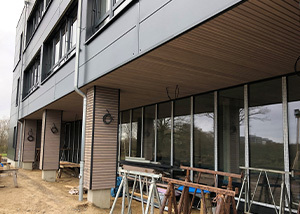 Until now, there are barely optimal technical solutions for light microscopic work that meet the requirements of safety, comfort, function and ergonomicst, e.g. Claire. Light microscopes are often applied in areas where a sterile work environment is important. Therefore, the product protection against contamination is required, The handling of living cells in the microscopy, e.g. in the in-vitro fertilization or, in general, in cell culture experiments make high demands on the technology. These are even higher when handling toxic substances and infectious material where additionally personal safety is required for the user. Zeiss Primovert HDcam - Simple. Intelligent. Integrated. In combination with the high-performance, inverted microcope, the Zeiss Primovert HDcam, a safe workplace is emerged as perfect symbiosis on the highest level. Primovert is especially developed for the observations of cell cultures. This inverted microscope combines efficiency with high performance. Primovert ist compact and can be used directly in the safety cabinet. It fast and efficiently enables the observation of undyed cells in phase contrast and GFP-labeled cells in fluorescence contrast. The inverted microscope is perfectly suitable for cancer and genetic reserach. 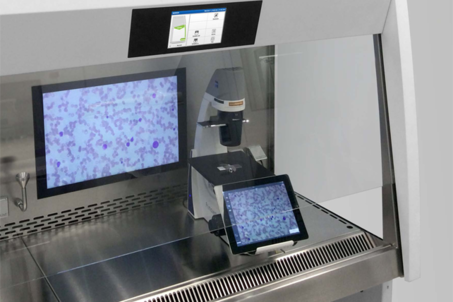 Observate cells with Primovert HDcam and Imaging App Labscope for iPAd and discuss cells with your team - Independently from the sterile work environment. The connection of the Primovert HDcam microscope to the large 22“-monitor of the safety cabinet facilitates safe and facile working - no extensive, special window openings for oculars are necessary. 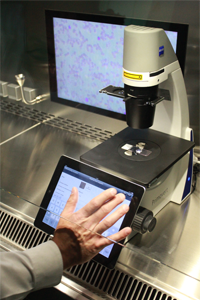 Control the microscope from the supplementary Imaging App Labscopefor of the iPad or discuss results with your team.